Energy Efficiency | Buyer's Guide | Are Energy Efficient Homes Worth It? Energy efficient homes are fascinating. For most people, aesthetic elements hold the most interest: the architecture, the interior design, the gut rehabs and DIY improvements that can turn the derelict into the magnificent and create a sense of place, an experience of space and belonging. For those of us interested in energy, homes are fascinating from a different perspective: they are collections of energy systems where fuel and electricity are converted into light and heat and sound and other useful forms. To make sense of what constitutes a truly green home, it is useful to delineate the systems that influence a home’s energy efficiency and energy use. While these systems are interrelated, each plays a distinct role in the overall home energy efficiency picture. This article outlines each system and how it influences home energy use. This can be helpful for identifying opportunities for energy efficiency improvements, and for evaluating the expected benefit of these improvements on your home’s energy use and energy bills. This also provides a glimpse into the complex workings of the energy systems that surround us day and night, throughout the various buildings that we inhabit. You might think that this discussion would start with the home in question, but the building’s location is actually the first key to its energy systems. Climate and geography determine every building’s needs for heating and cooling, including microclimates that are specific to the building’s location. For example, the south and north sides of a hill will have different exposures to sunlight and storm winds. Trees can also shade a building’s surfaces and block winds from different directions. Adjacent buildings and nearby structures can play a similar role. When considering a the energy system of an energy efficient home, it’s important to factor in the way that site and landscaping will impact the building’s needs and opportunities for energy use. The outer shell of a building, known as the “building envelope,” is one of its most important energy systems. This shield between inside and outside provides a barrier for weather, and air & moisture. In short, the building envelope contains the heat and humidity of the building’s interior independent of the heat and humidity outside. A tight seal on the building’s exterior will increase a building’s energy efficiency. Conversely, a leaky envelope can undermine a building’s ability to use energy effectively, and can contribute to the building’s decay over time. Some approaches to energy efficiency, such as the Passive House standard, include a specific standard of thermal performance for the building envelope. Upgrades to insulation, air sealing, and windows can all increase the efficiency of existing building envelopes. Heating interior spaces is a major category of building energy systems. Common approaches include furnaces or boilers, heat pumps, radiant floor heating, electric space heaters, and wood stoves. Passive solar heating, which uses the position of windows and thermally absorptive surfaces to convert incoming sunlight into stored interior heat, is another approach. Mechanical systems and incandescent lighting can also provide interior heat, as can the body heat of the people inside a building. When thinking about the building energy system, it’s helpful to distinguish space heating from space cooling and ventilation. Heating, cooling, and ventilation can be provided as separate systems, or integrated in a combined HVAC system. Cooling interior spaces is the flip side of space heating, but is often provided by a distinct system. This could be window air conditioners in a building with a central furnace, or a passive convection system that uses heat in the upper reaches of a building to draw cool air throughout the building’s interior spaces. Like heating, space cooling can be provided as a separate system or integrated in an HVAC system. The need for space cooling depends on climate and location, but many view space cooling as a requirement for their home, especially in warmer climates. Ventilation systems replace stale or contaminated interior air with fresh air from the outside. In its simplest form, an open window provides ventilation, and may also cool interior spaces during warm weather. Because the air temperature outside is often very cold, and because interior air contamination is typically concentrated in specific locations and rooms, buildings often use mechanical systems with fans to move air at controllable rates. The ventilation system is part of the home energy picture because it moves air and moisture across the barrier of the building envelope. In some cases, a ventilation system is also used to move heat. However, this can be highly inefficient – the amount of air movement required for heating and cooling is typically an order of magnitude higher than the amount of ventilation required for replacing stale air. Ventilation is particularly important in energy efficient buildings with tight envelopes. When a building’s envelope succeeds in limiting airflow between the interior and exterior, it may require a ventilation system to provide fresh air to its occupants. In these cases, green homes may use a heat exchanger to recover much of the heat from the outgoing air stream and move it to warm the incoming air in winter — or the reverse in summer. Energy recovery systems can also transfer humidity, further increasing the efficiency of the energy transfer between incoming and outgoing air. A building’s interior and exterior lighting system uses energy, typically by converting electricity into lumens. Lighting fixtures, especially old-fashioned incandescent light bulbs, also emit heat as a byproduct. Green homes typically use more efficient lighting solutions, including fluorescent bulbs and light emitting diodes (LEDs), which generate less heat and more light per unit of electricity consumed. The arrangement of windows on a building’s exterior and the natural daylight that they admit can reduce the need for artificial light at different times of the day. The arrangement of lighting can also increase the lighting system’s efficiency. For example, task lights focus light in a particular space, rather than lighting the entire room, delivering more usable light and less light overall. Water heaters consume a significant amount of energy, especially if residents use hot water indiscriminately. There are multiple ways to improve the efficiency of a home’s water heating system. If the water heater has a tank, the tank can be insulated so that it better retains heat. Tankless on-demand systems provide another approach to efficient water heating. In a standard water heater, thermal energy is progressively lost to its surrounding in large or smaller amounts depending upon the degree to which the tanks is insulated. Tankless water heaters eliminate the need to store thermal energy, reducing energy loss. Solar hot water heaters, which convert the sun’s energy directly to thermal energy for water heating, can also be installed. 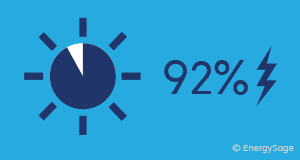 A big impact on a home’s energy efficiency related to water heating is water use. The more hot water you consume, the more you need to heat it, which uses energy in the process. Water saving measures, such as low flow fixtures, have the added benefit of saving money on water bills and reducing energy use from water heating. Another water saving technology is PEX piping, which delivers water more quickly between the water heater and the tap. This lowers the amount of time that you have to wait for hot water, and increases the efficiency of the water heating system as a whole. A home’s appliances use energy, and can be upgraded to energy efficient versions. Refrigerator technology, in particular, has come a long way – refrigerator upgrades can provide a great return on investment from an energy savings perspective. Other home appliances include dishwashers, clothes washers and dryers, ovens, stoves, humidifiers and dehumidifiers. 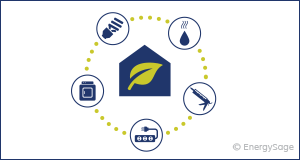 All of these appliances use energy and can be made more efficient through high performance technologies. One example is induction stovetops, which are much more energy efficient than traditional electric or gas ranges and becoming increasingly common. Homes include a variety of electronics that consume energy, such as televisions, computers, and audio systems. While the efficiency of individual electronic devices has generally increased over the last few years, so has the number of these devices. Electronics also have a peculiar habit of draining energy when they’re not in use. These “parasitic loads” use energy any time electronic devices are plugged in, whether in standby mode or turned off entirely. Because this kind of energy drain happens 24/7, its impact on a home’s energy use can be significant even if the amount of energy consumed is rather small. Last, but not least, are the controls systems that govern and regulate the home’s energy systems. The most familiar of these is the thermostat, which governs the home’s systems for space heating and cooling. Smart thermostats and programmable thermostats can provide considerable energy savings, simply by changing the timing of space heating and space cooling. Lighting timers and motion sensors are often used to dim or turn off lighting when a space is vacant, especially in hallways and less frequently used areas. Parasitic load switches eliminate the slow sip of energy from electronics and appliances that use energy even when the devices themselves are turned off. In some territories, consumers can even receive income or bill credits for reducing their energy use at specific times of the year. Now that we’ve identified the many ways that a home uses energy, it’s important to highlight the different sources that provide it. Most homes use electricity, which is generated from a mix of fuel sources before being transmitted and distributed across the electric grid. Many homes also use natural gas or propane for heating and cooking. Additional fuel sources include heating oil, wood, wood pellets, solar thermal energy for hot water and solar photovoltaic (PV) systems for generating electricity. Fuel switching creates unique opportunities for energy efficiency upgrades, and can facilitate synergies between various home energy systems. For example, a heat pump for space heating can partially replace the need for heat from other fuel sources, and can be powered by a solar PV array on a building’s roof. Water heaters, clothes dryers, ovens, and stoves can be gas fired or electric, and can be selected for integration with other home energy systems. Old boilers powered by heating oil can be upgraded to highly efficient wood pellet boilers. New systems using old fuel sources, like wood, are sometimes surprisingly efficient. Electric vehicles are another example of fuel switching. These vehicles use electricity instead of gasoline as their fuel source, and this electricity comes from the home’s electrical system. Adding an electric vehicle will add to the homes use of electricity, but it will eliminate the use of gasoline, a switch that typically creates significant cost savings. Electric batteries are also gaining in popularity, often in concert with solar PV systems. Batteries are part of the home’s electrical system, but they can play a key role in fuel switching. By storing electricity, and allowing the home to use solar electricity produced during the daytime after the sun goes down, batteries allow more home systems to be powered by solar electricity. A home solar PV system can compound the savings of energy efficiency improvements you make in your home. In 2016, the average solar homeowner paid off their solar investment in just over seven years, and generated 92% of their total electricity use through solar. Switching to an electric vehicle, switching home appliances from gas to electric fuel, or installing a heat pump are just a few of the ways to benefit from electricity savings through solar. These building energy systems and fuel sources provide ample complexity and opportunities for investment in energy efficiency. A whole systems view also helps identify considerations for combining these energy systems in new and interesting ways. For example, a tighter building envelope might reduce the need for space heating and cooling, and consequently the size of heating and cooling systems. It could even eliminate the need for certain systems that might otherwise be required with a leaky building envelope. Lighting upgrades that reduce heat from lighting fixtures and ventilations systems that create convection can reduce a building’s need for cooling during warm weather. This perspective can also be extended to systems beyond the home itself. We started this discussion with the impact of the site and landscaping on the building’s energy use, but the building also impacts the site and land and the broader environment. A building affects the electric grid by its use and production of electricity. It affects a landscape’s hydrology by its water use and its impact on storm water runoff. It affects the climate and future geology by its use of fuels that produce greenhouse gases. The energy systems and fuel sources that determine a building’s energy are situated within broader human, technological, and ecological systems. A whole systems perspective can also be useful for understanding the building’s impact on the broader systems beyond the building itself.